This is a shout out to all readers/listeners of our Cobra interviews. I will be joined by Justin Deschamps as co-host of this special interview. Prepare For Change is joining forces with Corey Goode and Justin Deschamps to promote a special meditation to be held on the day of the eclipse: August 21st, 2017. For the next 4 days only—I am seeking questions on meditation and other topics of interest appropriate for this joint interview. This is our chance to advance as a united people, to stand in solidarity for a common cause. We are all desiring a new society, free of debt slavery, where people can follow the path of the heart, be engaged in work that is joyful and fulfilling. Now is our chance to join with a larger community to create what it is we desire. It is through peaceful means, that we will overtake the dark and create our new society. It is by love that we will win. 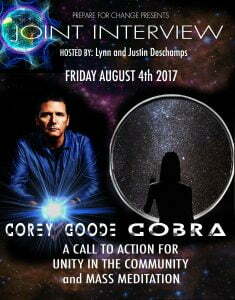 Corey Goode will be answering questions alongside of Cobra. They each come from a different experience but the goal is the same: to create “unity in the community.” Please submit meditation oriented questions and other topics appropriate for this special interview. The days for these questions are July 22nd through 25th. We look forward to a lively discussion and wise words from both our honored guests. Do I really need those special sunglasses to look at the Solar Eclipse come 21 AUG like the way the mainstream suggest? I always thought sun gazing was good for us. Sun gazing is only good at sunrise and sunset – and only for a few seconds at a time – yes, you need the glasses. I would like to ask both Cobra and Corey to speak about the quantum computers.Really they will make a simulated reality,which we well live in?Or we are already living in simulated reality?Speak Please about the transhumanism.Are these things good for us,or a trap for the humanity?My other question from Cobra.What does it mean that the holocaust is a hoax?My half family died during the war,only my grandma survived Dachau.I had a lot elder friends,who survived the camps.My mum had to hide as a young girl.We weren’t evil,rich greedy jewish family.We were poor.In this website I read that holocaust was a hoax.I’m not asking it sensitively,just curiosity and the truth is not bothering me.Thanks a lot. Vatican and the Jesuits are still running around freely, and exercizing their power for the dark. This being said, why has the resistance not removed or neutralized the heads of this negative entity. Same goes for the ruling families. Seems to me we are nipping at the lower ranks of the pyramid and not much is being done on the top to neutralize the real power structure. Maybe it is, and we simply are not privy to that work. Kindly reassure us that this happening. Why do I still see chemtrails being dispensed around the Detroit and Windsor area. Seems to me these would rather easy for the resistance to stop or neutralize them as the resistance is up there watching them do it. You have my permission to clean this one up. I am sure I am not alone. I thank you from the bottom of my heart for the work, and for sacrifice you are doing on behalf of humanity. May the blessing be and victory to the light! Hi, the PFC website went down for me and I could not access it for about 20 minutes when I asked my questions. So I wrote them out again, so I may be posted twice. Thank you for your patience. Hello, this question is for Justin, Corey and Cobra. 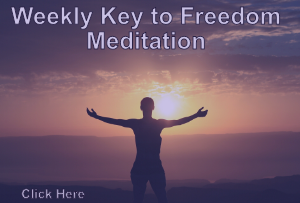 I would like to know if there is a weekly meditation format that the three of you would promote on your platforms that would help unite humans for peace and for helping to bring about the Event with the goal of 144,000 or more humans or more participating in the same meditation every week, similar to the weekly meditation that Cobra promotes in his blog? The next question is for Cobra, if 144,000 or more humans, meditated on the agreed upon meditation format (as best each could) how would that help shorten the time to the Event, and would that help reduce the suffering and increase peace, love and healing prior to the Event? Thank you so much to all of you for your commitment to bringing about the Event. Hello, this question is for Cobra, Corey Good and Justin Deschamps, is there an effective meditation that you three can support that can be done weekly, perhaps in place of the Weekly Ascension Meditation that followers of Cobra participate in, so that it can be promoted by all three of you on your various platforms? The goal would be to unite, to have a weekly meditation with 144,000 or more meditating, to help the Light Forces who are helping us, and trigger the Event as soon as possible. Also, Cobra, would this have a positive impact for the beings of Earth pre-Event (beings to include also flora, fauna, Earth herself, etc.)? Thank you so much for all of you and the work you do to bring Light, truth and healing to all of us. Victory of the Light! Dear Cobra, dear Corey, Thank you very much for all you are doing. There is one question wich comes to my mind every now and then. When we will have replicators, what will be with art and handmade products? Will it be easy to copy or can pieces of art stay unique? And there is another one. I think it is important to spread printed information on the day of the event. Until now it is not easy to find people wich are willing to build a group and to take efforts to help planing this. Will it be dangerous to be outside on that day? Could you please explain again how necessary it is to come together and find ways and structured action to find solutions in every possible area for spreading the event information in an effectively way? My question is about China. China has almost 1.4 billion people. The world population is 7.5 billion. Among every 5 or 6 people in this planet there will be one Chinese. Therefore when we talk about Event or ascension of this planet 1.7 billion Chinese has big impact for these progresses. I have been following Cobra’s blog since 2012. I watched Corey’ Cosmic Disclosure every tuesday.From bottom of my heart I know what you are taking about is real.As a Chinese living in Canada I have the benefits to learn all these knowledge which helps me wake up. Last month I was in China where I told couple of my friends all these things I learned. They laughed at me. For them I seemed mess up with sifi fiction.Actually they are really open mind people. They have good education and good family life. They refect most of the middle class people in China.So what I concern is that what disclosure means for them. Will they be shocked.? The internet is censored so people in China does not access to these knowledge. My question for Cobra is: did lightforce work with Chinese government to push the disclosure.? How Chinese government involved in this movement? The conference in Taiwan was very successful and people in Taiwan did execllent job. I also like to ask cobra : do you have plan to hold conference in mainland China in the near future?if possible which city will be ? Will it be Chengdu.? Is there any lightwork group in mainland China work with you for the event.? Lastly I have one question to Corey. I am curious when you were shown the humans history on the glasspad, or was given knowledge by Ka’Aree did you recall anything related to China? If there is , would you like to share here please. I appreciated. Don’t feel bad, like you I have followed this information for many years & am totally awakened to the truth but every person I discuss this with in the US thinks the same thing your friends do. It’s disheartening as we are just trying to wake up people but they are going to have to find this out for themselves in their own time, at least we put the “bug” in their ear. For very mind polarized people like myself, how do we know we are ‘meditating’ and not just sitting quietly? I tend to feel anxious and frustrated after trying to meditate because I am looking for effects and wondering about results, how do I know my intention is working? Is it just some subtle thing that will come to me over time? Why do I feel so silly quietly aware of every minute itch and sound around me only to wake up realizing that I must have just fallen asleep? I understand your comment and frustration, Yeneros. It’s hard to give a definition of meditating, what it is. There are many ways to do it, that’s for sure. You can walk and concentrate on the touch of your feet on the earth, following your in- and out-breath in calm concentration without altering it for effect or making it an effort. Anxiety, frustration, looking for effects and wondering about results is all in the realm of your mind and its windmills. Nothing wrong with it, but these issues are wayshowers to you, telling you something. You’re the one who can know what it is they tell you, but it’s clear that so far, your experiences don’t work for you. might help you to find your way into an experience that you may begin to call “meditation” experience-wise. It’s helpful when it’s clear to you what it is you’re after, what’s envisioned by you as a result? What matters is, as I perceive it, that you find relaxation and calm in quality time for yourself and equally important is that your desire to meditate stems from enthousiasm. And not from a mindset that forces you to meditate because others have told you that it’s a must, or a doorway to happiness. That’s not how it works, see what I mean? Better be creative, even with a strong focus on your mind and its windmills. Observe your mind’s antics in a neutral stance and see what you can do to step out of your “comfort zone” as a creature of habit. Change your daily routine, the way you tend to do things or the way you relate to your feelings, or people around you. Throwing yourself out of such “comfort zones” out of the fixation “I am like this, it’s who I am” is a helpful way to shake off shackles that prevent you from the freedom to be in wonder and at ease. Ponder my suggestions and see what works for you, acknowledging yourself in each little step you make. Start in small ways, take small steps, one at a time. I have a similar question about having difficulty meditating…it’s been like this since May 2017. Prior to this I able to follow guided meditation (30mins – 1hr at a time), see many beautiful light/energy behind closed eyes, feel the energy radiating from all over my body to a point where I feel suspended in air, etc. Since May, I feel like I went offline. I doze off, my mind gets chatty, I don’t see the lights and I feel only slight energy charge in my body during meditation. Coincidently, I’ve also got pregnant in late April. And, naturally, I experienced my first trimester aches and pains, which I found are quite similar to ascension symptoms. BUT, it felt like I got double or triple strength of the symptoms compared to my first pregnancy. This became more evident when I had to call in sick for days at a time because of vertigo, which I recall experiencing when I first began meditating. I especially felt a lot of movements in my head…pressure on my temples and third eye, etc. I stopped beating myself up for not being able to meditate “properly.” I still listen to guided meditation regardless…because I KNOW now…I don’t constantly need confirmation that “IT” is real. I know to TRUST…only this time, I learning to SURRENDER too. I want to continue assisting in the shift…and I feel that I AM by continuing to meditate and living in the KNOW. Your thoughts? My family and I avidly read all information that you guys provide and hope that these positive changes are really happening. But, considering the recent concerns for “proof” put forth by Dolan and others, my question is, how should a person process information that has not been experienced or seen? Besides using discernment, can you provide some “validation” of positive gains made by the resistance movement and/or the alliance? Thanks! In unity! Victory of the light! it is so very difficult for us usual humans to find the way rising consciousness and ourselves in everyday life. there is so much lies and dissipation (“divide and conquer”) from the cabale and elites. so many wrong “good” narratives we get told daily. how can we cope with that; it is a hard task to find decent people in these times, for the masses are merely brainwashed sheeple. our society structure is getting cracked down and dissipated with the steady blame of “racism”, instead we have to bow down for Islam, which is racism and fascism also. what can we do against Islam??? this is a crucial question in many peoples everyday life, when their usual life is getting flushed down and called not worth anything anymore, because clinging to that would be “racism”. how can we get people awake and vote for freedom and peace instead of Islam and Merkel??? the cabale ist changing our lives and socitey for bad, everyday. and single people do not have the strenght to resist that against the mass and the media. they are singled out by politics and laws and therefore they have a lot of fear. this is depressing, so much brainwashed people, its like 1933 in Germany / Europe again! I wish victory for the light, and peace for every soul. I don’t meditate last months because I can’t focus. Visulate light into the earth is difficult, so mostly I quit. Cobra, this question was asked a while back and you said you couldn’t answer it. Maybe now you can? What is the blue light myself and many other people are seeing while meditating? Thanks. Ditto. I used to see blue and other colors during meditation…and just before I started having difficulties meditating a few months back, I saw a large blue orb circling on my stomach. There is a lot of information and probably misinformation out there about chakras and the energy body. It is hard to know what is trustworthy. What suggestions or information can you give about understanding the role of the energy body in meditation, significance of chakras, and so on. —Firstly falling asleep while trying meditate is common and natural,,your Body and Mind have a life time teachings to do just that,, Sleep when its relaxed and meditation is relaxing to a larger extent to free the mind from the body,,,now the following is not my ideas or creations so to speak just something somebody said that helped me..
—-For me I used a couple ideas I read about,,,,first exercise is this,,,,At the moment you become aware you are waking up,, before you yawn, stretch or even move,,,think about what you were just thinking about,, I used a alarm to wake myself at oddball hours to practice this and if your like me and whatever those thoughts were seem to fade as you become fully awake,, write them down first thing and yes this used also to remember dreams,, but the point here is this, there is a point when you wake that you are in that zone I mention above,, this exercise is more or less just to help you be aware of that zone and perhaps become more comfortable while there..
—-Now to how to train yourself to be to pull yourself back from sleep,, You need a sting and a roundish object of a few ounces in weight,,,take the sting and attach it to the object,,(Hot glue gun,, steel ball bearing about the size of a quarter and about 10 inches of string is what I used).. lightly tie the string around the index finger of your dominate hand ,, place object in same hand and as stated above when I meditate I sit in a chair and hold this steel ball,, at the point when I get to the zone is were shortly afterwards i would fall asleep,, now when that happens,, my hand relaxes, the steel ball falls jerking my finger, which in turn bring me back to awakefulness,,But not fully awake,, groggy if you will,, but much easier to get back to the zone,, But I just brough myself back from sleep…. —-Nothing to be ashamed of everyone goes through in one way or another and if they say they didnt they are lieing,,lol,,, hey I knocked holes in my walls in my fights, literally ripped my sheets apart,, frakking really maddening thing was this,, When I would wake up,,,I could remember I had been fighting,, I mean hard like a life and death struggle ,waking up tire sweaty and pretty much wore the frak out,,, BUT NEVER REMEMBER WHY…So I got a new idea of finding out who I was fighting or who was basically kicking thwe Sh#t out me,,lol,,, Figuring on the ole adage of know thy enemy type thing…. —- Guess what I found out at the level of meditation there is only ONE person you may meet and only if your lucky and thats your higher self and your Higher self only has One purpose and that is to help you get to where you want to get or achieve your goals,,,Now remember your higher self is not you,, it is a part of you that you dont know it or even how it operates,, which at times seems strange if not down right crazy,,, But regardless of its methods,, it only has one goal to help YOU achieve your goals,,, those methods that have been colored by a life time,, your lifetime of progamming,, Have you been programmed to succeed or fail,,, Have you been programmed to accept unknown concepts or fear them…You not fighting some monster or demon,,witch or the dark side,, you are fighting your higherself trying to help you ,,lol.. When meditating, how long will I need to meditate before I can obtain the answers within? Mary, can you give me more information. Cobra will ask me to “specify” the question. Hey guys I’ve recently been struggling to meditate. It’s like I fall asleep during the whole thing and am open to attacks I can’t remember. When I wake I feel drained and confused. I’ve tried many techniques, crystals etc but still the same thing. I feel like something is blocking me and wiping away my memories. I’m also struggling to visualise the light sometimes. More when I feel this presence affecting me. When I ask for protection it’s like I’m tongue tied and the presence twists what I say. I’m not deterred, I figure if something is working so hard on blocking me and preventing my progress that what I find must be good. I’m also a terrible wheezer and my squeaky breathing is a distraction. Wow, can’t wait! Victory of the light!